Many carpets can be made with either Bulked Continuous Filament (BCF) or shorter Staple fibers Polyester and nylon carpet can go either way, and most olefin carpet is BCE. What’s the difference? The staple fibers arc shorter and bulkier like wool, while the BCF fibers are longer and less prone to wear and shedding. In most cases, either will be suitable, but if you have dogs, cats or another situation where your floor might go through some rough treatment, you’ll definitely want to make sure your floor is made from BCF fiber, since its harder for the fiber to be pulled from the floor. Some carpeting features blends of material to incorporate certain benefits of one fiber into another. Olefin or polyester carpets will be mixed with nylon fibers to increase strength and wear resistance without raising the price. Similarly, some wool carpets will incorporate a certain percentage of polyester or olefin to create a textile that offers much of the natural beauty, warmth, and durability of wool carpet at a price that is easier to afford. While these blends don’t offer the same benefits as pure nylon or wool, they typically perform better than most polyester or polypropylene fibers and may be an option well worth considering. Nylon is the number one choice for carpeting, and has been for decades. Much of today’s nylon carpet features better durability than any other fiber available, excellent stain resistance and is one of the most cost-effective options available. It is excellent for use almost anywhere in your home in any type of carpet construction. The latest generation of carpets is the sixth-generation, often referred to as Nylon 6 or Nylon 6.6 fibers. These fibers are specifically engineered to be tougher and more durable, provide almost a lifetime resistance to stains and abrasion, and resist wrinkles or abrasive wear damage. All carpets made with this advanced nylon are more expensive but highly recommended whenever possible, as they are suitable for use almost anywhere in the home, and are definitely the type of nylon to use if you’re worried about stains. They also typically carry much better warranties than other nylon floors. However, all nylon carpeting is durable enough for most heavy usage. Finally, carpets advertised as particularly soft arc made using much thinner fibers in greater quantity, so they have the same properties of sixth-generation nylon carpets, but are softer and more durable. 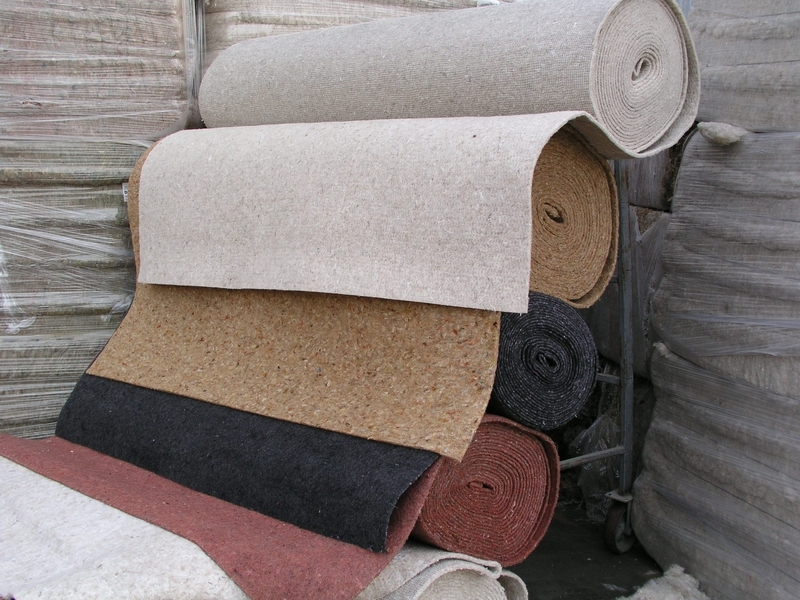 Less popular than olefin, recycled PET (Polyester) carpet is an inexpensive alternative to wool if you’re looking for a carpet that’s environmentally friendly. Like olefin, it has built-in stain and moisture resistance, is colorfast and feels extremely soft. However, it is much stronger than olefin, and well-maintained high-density polyester carpets can perform as well as nylon at a significantly lower cost. Because of its softness, it is especially recommended for cut pile construction. Polyester carpeting has been around for decades, but PET polyester fiber is a newer innovation made from recycled PET products like plastic soda bottles. This makes it the only manmade fiber that provides eco-friendly carpets. It is similar to nylon in terms of durability and resistance to wear, and has the moisture protection, stain resistance and colorfastness of olefin. It isn’t as inexpensive as olefin, but it is still quite cost-effective. And while olefin carpets are primarily recommended for berbers, polyester carpets are stronger and can easily work in a cut pile setting. Polyester is not as strong as nylon, and if you have a room with heavy traffic. Nylon is still the best option. But for light use around the home, polyester provides an excellent way to have a soft plush carpet at an affordable price. Wool fiber has been known as the gold standard for carpet material. Although more expensive than many engineered fibers, it is an excellent option for carpet, easily the softest, most luxurious fiber, flame-resistant, and is one of the only ecologically friendly carpet fibers. If you have a small room in a formal atmosphere, wool would be a beautiful choice. However, there are some important disadvantages to wool. First, since it cannot be machine-produced, it is by far the most expensive material for carpet, costing sometimes twice as much as even the best nylon floors. Secondly, it is typically one of the most stain-resistant fibers, but requires special care, as carpet cleaners designed for other materials can permanently damage the carpeting. Olefin fiber was created in the late 1950s, and grew in popularity in the 1960s. It is the second most popular fiber behind nylon, and is well known as a low-priced alternative to fourth-generation nylons. It has several benefits that make it attractive. First, it is seriously resistant to stains and is colorfast, so your carpet’s color won’t fade over time. It is soft and lightweight, inherently resistant against water and moisture damage, and is not easily stained from most household items or strong chemicals in cleaning agents, including bleach. However, there are disadvantages for most polypropylene as a carpet material. The most serious disadvantage is that because it is lightweight, olefin is nowhere near as strong as nylon, and will always mat down more easily than a nylon carpet. If you need a long-lasting carpet, nylon would be a much better choice. Additionally, it has a very low resistance to heat and because it is an oil-based product, it can attract grease stains and gives the carpet a slight sheen that may be undesirable. Olefin is most often recommended in loop (berber) carpets, since they are constructed in a way that minimizes wearing or crushing. However, berbers with low density or without tight loops often are more difficult to vacuum, and dirt can be trapped underneath the surface of the carpet. So in other words, if you’re considering carpet and like the cheaper price of olefin, use its natural strengths and weaknesses to your advantage. If you need a carpet in a place that will have a lot of moisture like a pool house, outdoor carpet or basement, olefin is an excellent selection. Likewise, if you want to carpet a room that is informal and might get stained easily like a nursery or playroom, a tight, relatively low-level olefin berber would provide similar benefits to fifth-generation nylon but would be softer, naturally resistant to stains and water damage, could be deep-cleaned without harming the fiber, and would look good even in between vacuuming. There are other materials, including acrylic and cotton, but generally, they are far less practical and can be difficult to find. Others like leather, linen or silk can be much more common in area rugs, and if you want to have the look of these materials, you’d do best to find a high-quality, inexpensive carpet and purchase an area rug to put over it. There are numerous other carpet materials out there, usually found in specialty brands, hand-made collections or carpet made overseas. These materials are most often found in area rugs, but can occasionally be found for use in carpeting. Cotton is an extremely easy material to clean, and is very absorbent, but is too weak for anything other than, light usage. Acrylic fiber was once common thanks to its similarity to wool, but is generally out of usage by this point since they are as weak as wool fibers but prone to wear quickly. Leather has been used as a material for shag and silk or linen can occasionally be found, though almost exclusively in area rugs. Server responsed at: 04/25/2019 4:36 a.m.